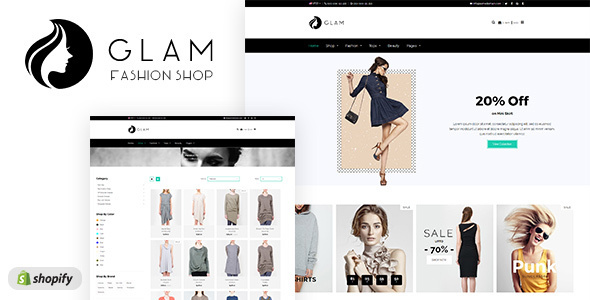 Welcome to Glam Shopify Themefrom DesignThemes. Glam Shopify Theme is the perfect fit for you. Using Glam Shopify Theme, launch your online store selling Cherokee Girls, SilverThread Casual Top, Iande Dark Pink Rayon and others like Rayon Crop top, Top pink leopard, Grey Polycrepe, Genzee Girls’s. Not to mention items like Dungaree Dresses, Pop Over Dresses, Sweater Dresses, Tops & Tunics, and Women’s Tops. Having developed more than 60 themes in Shopify platform, we offer our latest Glam Shopify Theme with intuitive features needed for successfully running your online store. Glam Shopify Theme comes with the latest and powerful technologies such as Sass CSS, Owl Carousel, Front Awesome and Animation.